The third lecture of advanced course was about "consciousness" that everybody wants to know. One reason why everybody is interested in consciousness would be because its existence is vague and invisible. And some of you might think if you can acquire the invisible power, you are able to cure patients and symptoms that you had been struggling with. What can you do when you are able to use consciousness then? This is beyond the lecture, but I would like to mention my opinions below. From my experience, there are mainly three things to point out; (1) The time of each session of treatment can be shorten because the speed of tonifying Jin-qi risens. (2) The body gets warm more, so the treatment effects lasts longer. (3) You are able to use a Teishin needle effectively. Let us look at each point in detail here. (1) If one can treat a patient in a short period, you are able to treat many patients, and as a result, many people can get benefit from it, and also the practitioner can earn more. However, once you are able to use consciousness, does the number of patients increase? Even though you can tonify the deficiency of Jin-qi in a short period and reference points change quickly, if you haven't acquire palpation ability to comprehend those changes, you are not able to use consciousness freely. Rather, in such a palpation skill, you cannot acquire consciousness. (2) This is as it is. As an actual feeling of a patient, the body gets very warm. In addition, they feel as if the whole body is wrapped up with something thin layer of air or strange feeling like subtle numbness. Even if the practitioner feels that he or she are able to use consciousness, it is doubtful whether he or she actually are able to use consciousness without such patients' feelings (of course, these feelings are depending on individuals though). And let us talk about (3) a Teishin needle. Treatment with a Teishin needle is the most subtle in terms of quality of stimulation. The most common stimulation with a filiform needle, it accompanies with certain quality and quantity of stimulation, so if the stimulation exceeds the patient's limit, symptoms may get worse or reference points may not change though there is nothing wrong with the quality of stimulation. However, it can be said that the quality of the most subtle stimulation of a Teishin needle is acceptable for any states of any patients. But, the issue here is the quantity of stimulation. The most subtle quality means the most subtle quantity, in other words, it is difficult to bring out changes of reference points. Once you acquire the skill to use consciousness, you are able to give such the most subtle stimulation in the most quick speed and the most effectively. That is, when approaching the cause of deficiency of Jin-qi, older and older it is, the strong quality of stimulation is unacceptable. In such a case, there is no other way except giving the stimulation little by little in each treatment session to arise changes. It means that it takes certain time to treat such a condition, but once you can acquire the skill of consciousness, you are able to make changes in the most rapid speed like a miracle. To describe this simply, you are able to change reference points that you have not been able to treat or change. Don't you want to treat what you haven't been able to treat? Every practitioner must long for it. However, do you think you can acquire such a skill simply by learning it?? Of course not. The demerits of consciousness. It would be that many people misunderstand it, many think that they are able to use it quickly. The consciousness is not a special ability. Everybody can get the skill as far as he or she makes an effort. However, the effort is necessary, it takes time. You can never acquire it quickly. I often compare it to "Kamehameha" of Goku of "Dragonball". He can even fly. However, Goku is not strong because he is able to shoot Kamehameha or to fly. Rather, he is strong, or he becomes strong, so he gets ability to shoot Kamehameha and to fly. Then, how do you think you should do to be able to use the consciousness? The answer is to deepen your skill of acupuncture, to become able to perceive reference points. More and more the skill of needling is risen, it accompanies the progress of the ability to comprehend reference points. Then, what is the skill of acupuncture concretely? At first, to be able to insert the needle at BL 40 easily. In addition, to be able to use a three-edged needle. To acquire the skill to comprehend reference points that are accompanied with it. Then, the time of treatment session can be shortened dramatically. Less than 30 minutes. You have to come to this level first. Without the ability of inserting a needle of BL 40 or the skill of using a three-edged needle, you never use the consciousness in such a level. 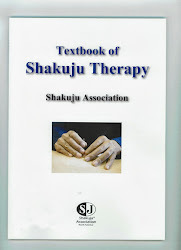 To learn a three edged needle at advanced course is the fourth year of learning Shakuju therapy, this is the shortest. But, you can't do what you just learned. So, after learning four years intensively, then the shortest would be the fifth year to be able to enter the world of consciousness. If it is compared with "Hunter Hunter", once you are able to use consciousness, you just pass the "hunter exam".